As the Second World War rages, two men battle for their humanity. Craw can feel the wolf stirring inside him and when it breaks free he doesn’t knows how long it will be before he wakens as himself again. Max Voller is a German doctor assigned to the SS to investigate psychic phenomenon. Surrounded by inhuman cruelty he is fighting for his life and his compassion. 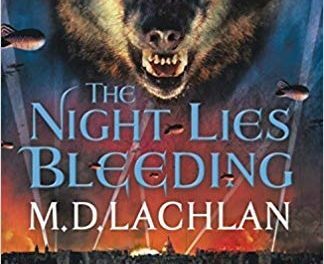 The Night Lies Bleeding is book 5 of a series. I haven’t read the others, but I didn’t need to to understand the story. The plot was self-contained, and all mentions to the past were sufficiently explained that I wasn’t left confused. However, at time’s Craw feels inconsistent, both hating the modernity of the world and working hard to fit in. I wondered if I had followed Craw’s character development from the first book, I would have felt differently. The narrative style is omniscient third person. It moves from character to character without a clear break. I found this jarring. Sometimes the jump to another character’s point of view wasn’t clear and I had to reread sections to make sense of it. This stylistic element made it hard for me to bond with the characters. That said, the treatment of the werewolf story is refreshing, drawing from the Norse mythology of the wolf Fenris in Ragnorak. Craw isn’t bound to the accepted laws of werewolves such as changing every full moon. Centuries can pass between changes. The curse also comes slowly, building in Craw over time until he can’t control it and he succumbs to the wolf. When Craw regains control, there are gaps in his memory. With each transformation, Craw loses a little more of who he was while battling with the knowledge that his return means the wolf has sated its hunger with the lives of mortals. The most intriguing element of this novel is the different journeys of Max and Craw. Both men are fighting to retain their humanity in the midst of terrifying circumstances. 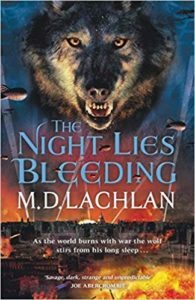 Craw, surrounded by blood and destruction, the very things that wake the wolf, struggles to keep it at bay. Max is as much a prisoner as those the SS are working to death. His world is cruel and apathetic. He might fool himself that he will save the prisoners, but once he’s with the SS there is no hope, not even for himself. The Night Lies Bleeding was an interesting read, not shying away from the horrors of the war, the atrocities human can inflict on another human and yet Crawford, fighting not to become the wolf, is the one called Monster.